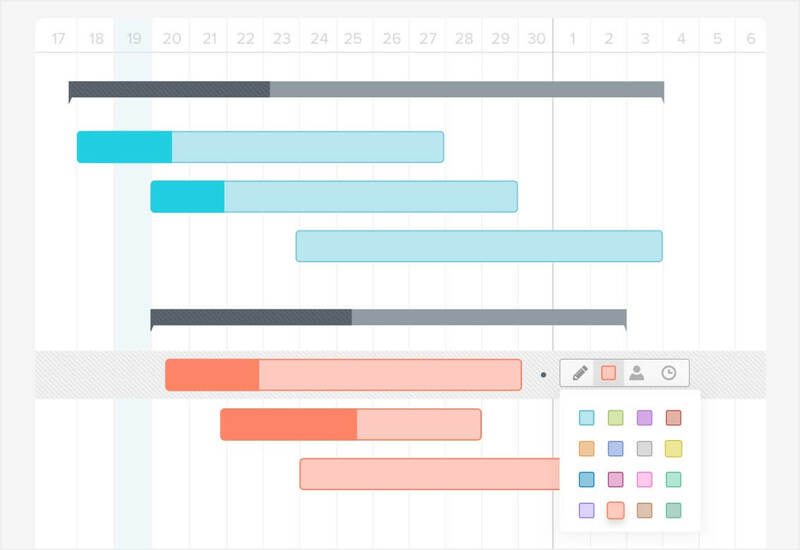 A gantt chart comes in handy when your project requires more planning than a basic to-do list. This guide will give you the basics of what you’ll need to create a gantt chart in Excel or TeamGantt. For a more detailed look into creating a turbocharged project plan, check out TeamGantt’s Guide to Project Planning. 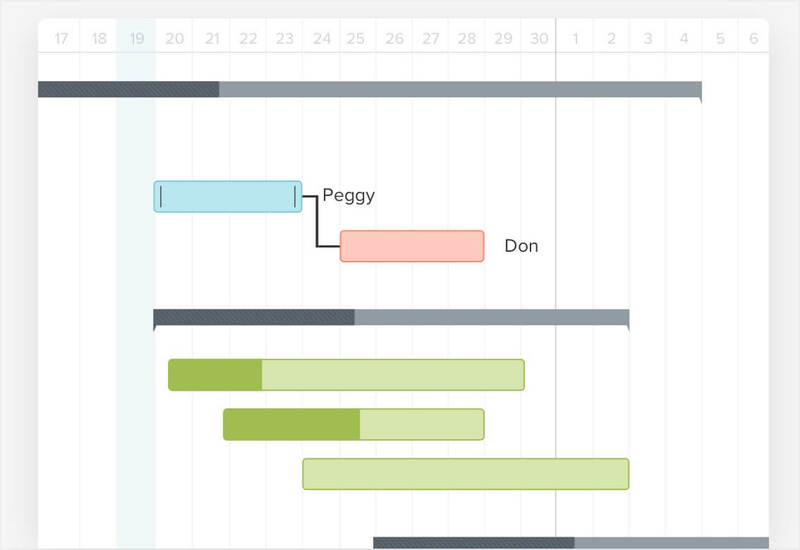 To build a gantt chart, there is important project information you'll need before you're ready to begin. What are the milestones we need to hit? Are there dependencies that could impact the timeline? Who is on the project team and what role will they play in those deliverables? 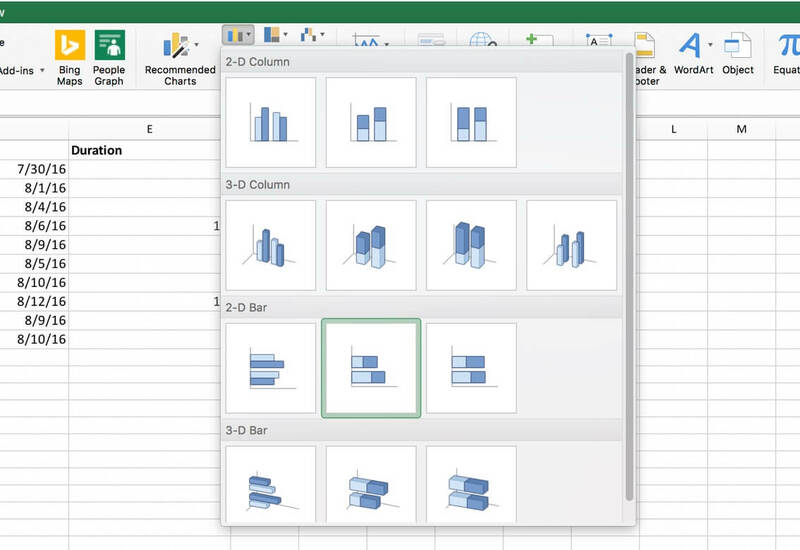 For Excel Beginners: Watch our video to learn Excel basics and how to make a gantt chart from start to finish. 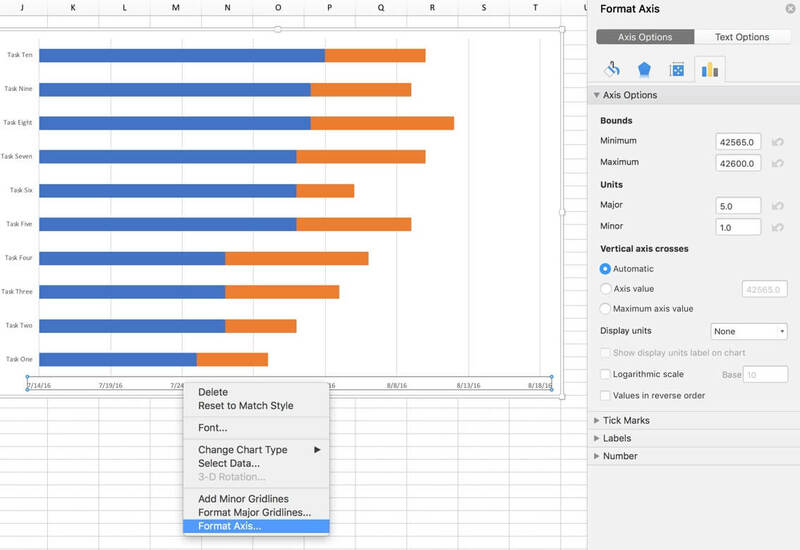 For Excel Fans: Keep reading below. Please note that we performed the following steps in Excel 2016, but the basic workflow should be the same in any version of Excel with minor changes. Create columns for Task Name, Start Date, End Date, and Duration and fill those cells with information from your project. TIP: It’s best to have the Duration field calculate the appropriate duration of the task based on the start and end dates. This is a simple formula. In this case, it’s =D2-C2. If you started in different cells in your worksheet, you’ll need to adjust this formula accordingly. 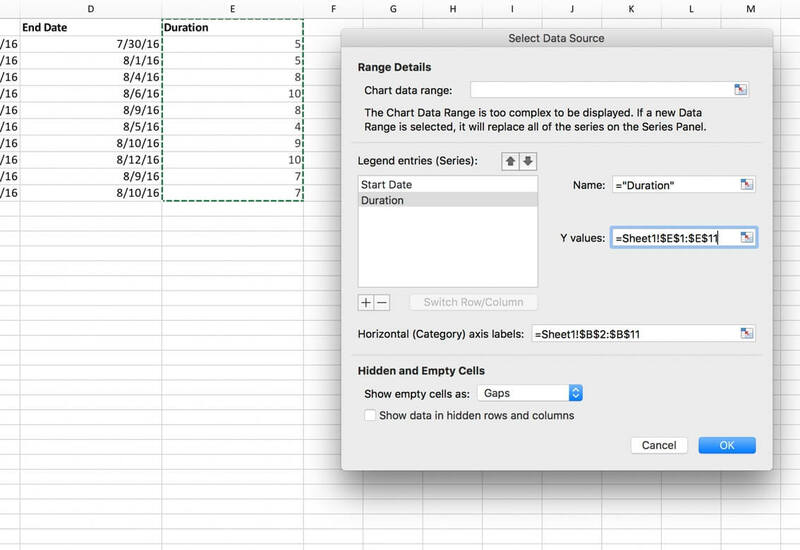 Place your mouse on the right corner of E2 until you see a black + sign and double click or drag your mouse down to paste the formula in the remaining cells in column E.
Insert the chart anywhere in the worksheet, then right click and choose Select Data. Click the plus under the “legend entries” section to add the first data set. 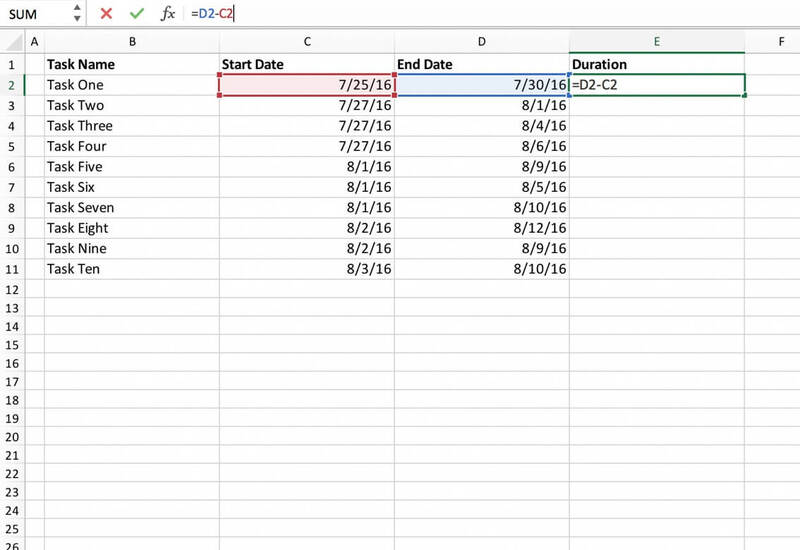 Name it “start date” and then click on the “y values” field. Now select the data in the start dates column. 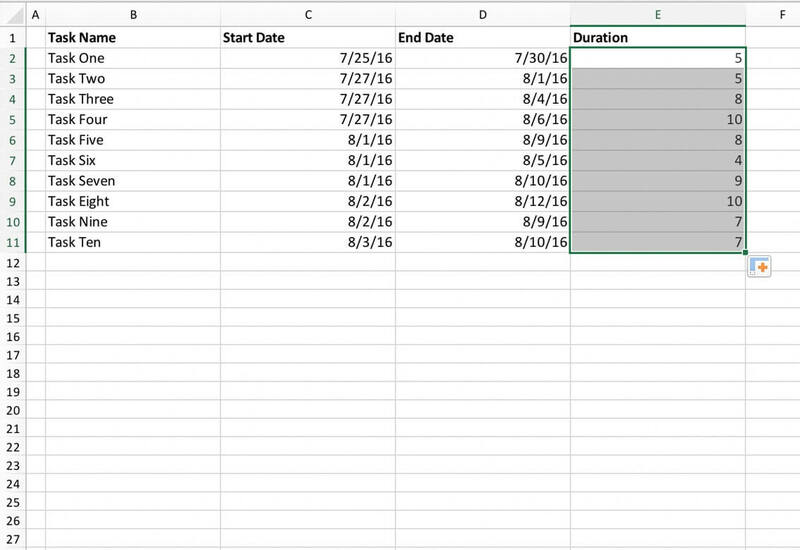 Add a second entry for “Duration” and select the duration column. 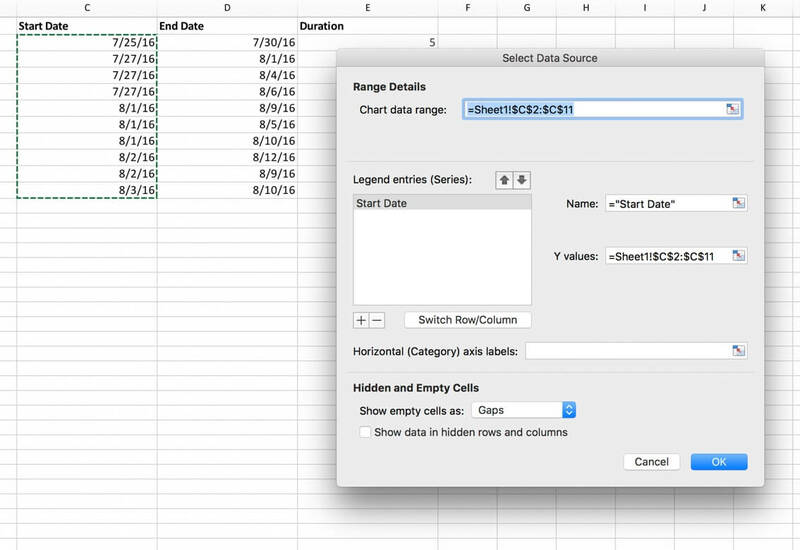 Click the “select data source” button in the “Horizontal Axis Labels” field, then select the entire task column. The first thing you may notice is that the dates in the horizontal axis aren't actually dated. Our chart also covers much more time than we need. Let’s get rid of all that extra time first. The first task in the project starts on 7/25/16 so there’s no need for our project to show anything before then. 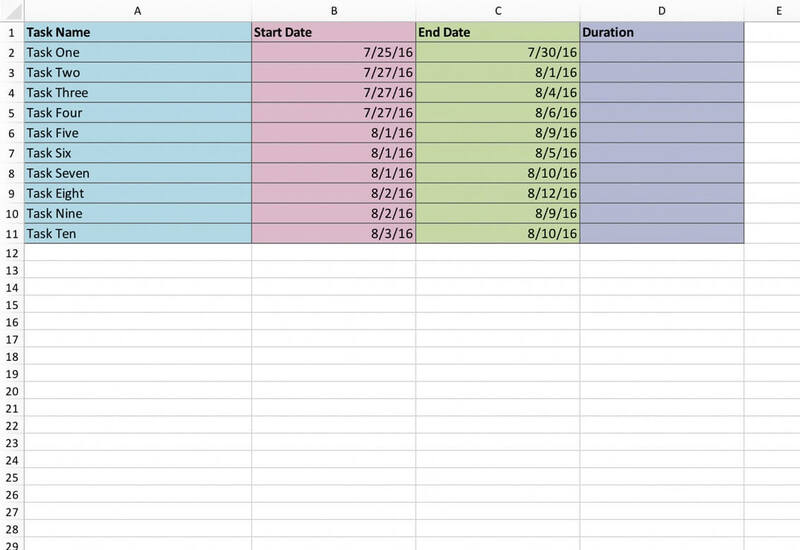 Copy 7/25/16 into a cell and format that cell as a number rather than a date. 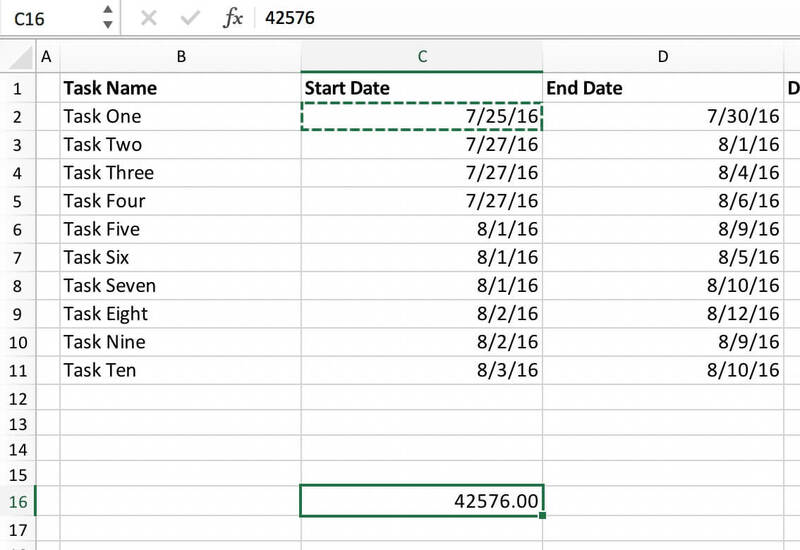 Excel stores date as numbers and you can see that 7/25/16 translates to 42576.00. Now highlight the horizontal axis, right click and select “format axis”. Under “Bounds” there are fields for Minimum and Maximum. 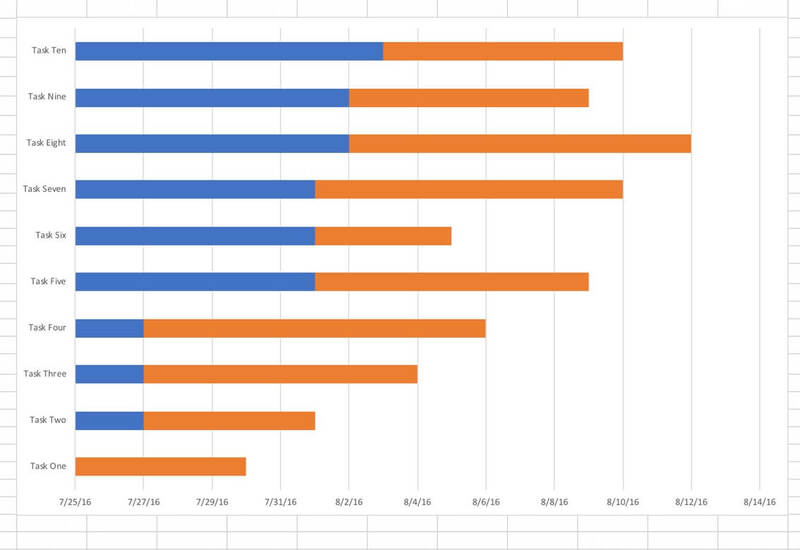 These are the first and last “dates” in the chart. If we change the minimum value to 42576.00 and hit enter, all that extra time will disappear from the beginning of our chart. To make the correct dates, go down to “Number” and change the category from number to “date”. Now the horizontal axis will show us readable dates. 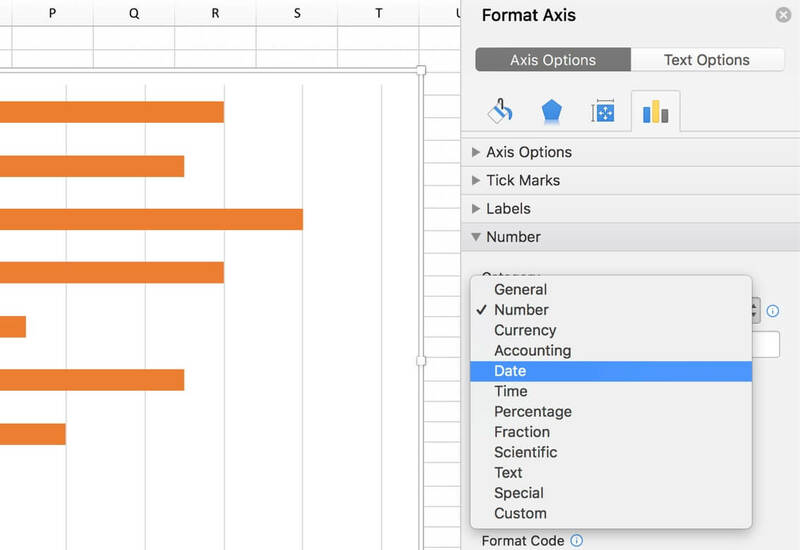 Highlight the vertical axis, right click and choose “format axis” to put the tasks in the right order. Tick the “Categories in Reverse Order” checkbox. This also moves the date axis to the top of the chart where it’s a little more useful for us. Click on one of the blue bars to select all of them and then go over to the paint bucket, expand the fill section and select “No Fill” to remove the blue bars that precede our task start dates. Click on a single bar twice. Don’t double click it, click it once to highlight all the bars in that color and then click it again to highlight a single bar. Go over to the paint bucket and choose the color you want from the color fill options. 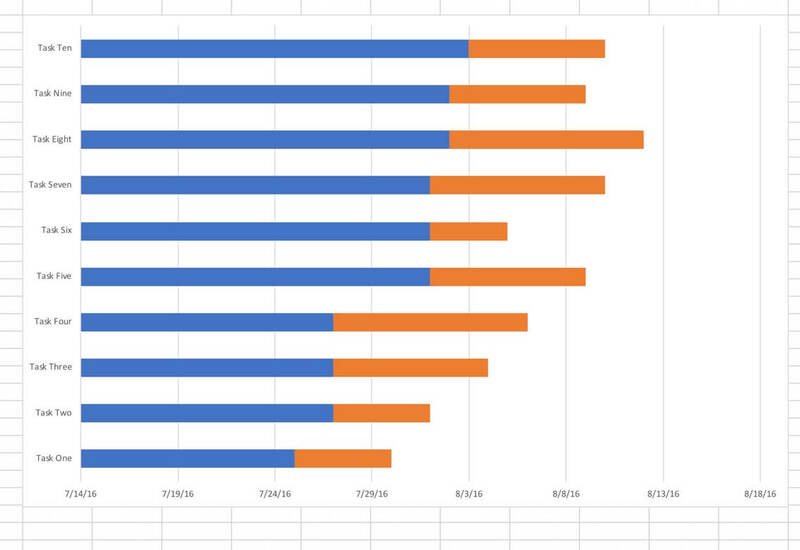 Repeat this process for the rest of the bars in your newly made gantt chart to change their colors. Congratulations! 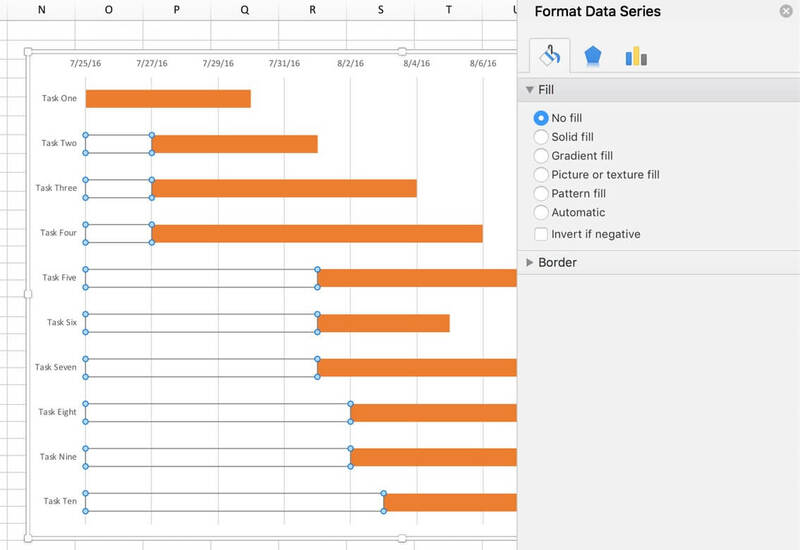 You’ve built your very own gantt chart in Excel. That was probably a few more steps than you bargained for. Especially if you have to do that every time you need to create a gantt chart for a new project. That’s where TeamGantt comes in. Sign up for your FREE TeamGantt account. 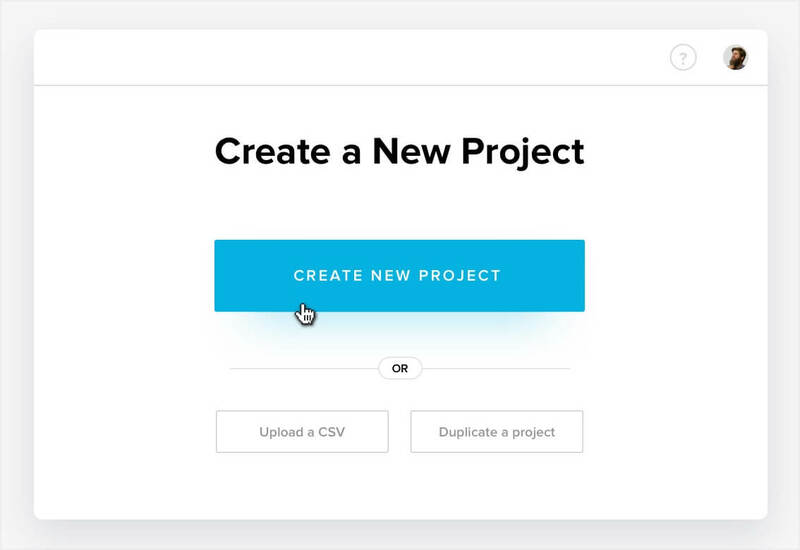 Click the ‘New Project’ button in the upper right corner of the ‘My Projects’ screen, then click the green ‘Create New Project’ button. Name your project, select the days of the week you want to be included in your project, and click ‘Save New Project’. 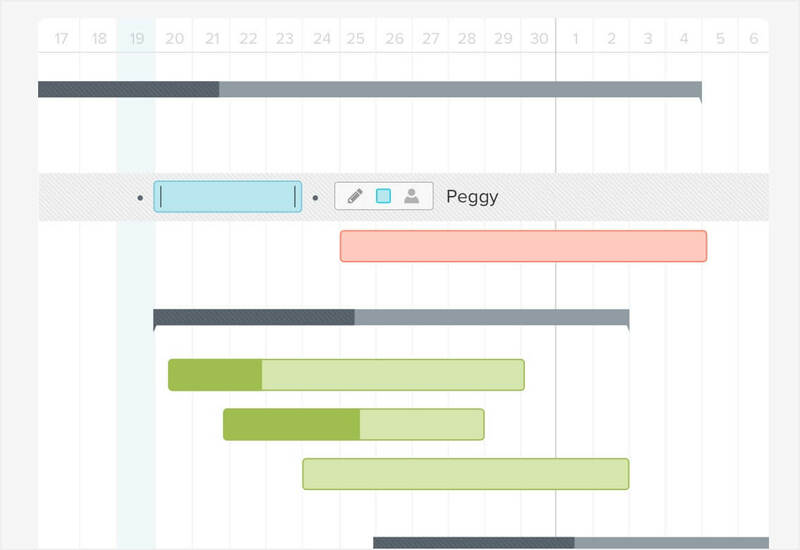 Adding tasks to your gantt chart is the first step in creating your project timeline. To create tasks, click on the Add Task button (+ Task) and type the name of your first task. Hit enter to add another task. Repeat this process until you have all (or most) of your tasks added to the task list. Now that you’ve got a full task list, it’s time to schedule all those tasks. 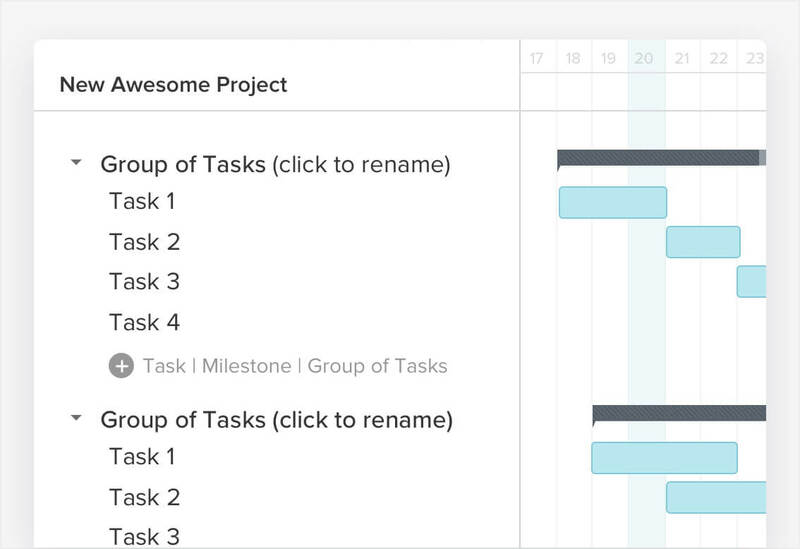 TeamGantt makes scheduling tasks super simple because you can click and drag each task for as long as it should take. Click in the timeline on the start date for the task and drag it out to its end date. Now that your tasks are entered and scheduled, hover over a task and click the gray dot that appears. Click and drag the dependency line to the task you want to link it to. Color is a great way to make your project easy to understand at a quick glance. Hover over a taskbar and click on the colored square. Choose a new color and you’re all done. TIP: You can even change the color of multiple tasks at one time by holding down the shift key on your keyboard to select multiple tasks and then use the same color picker to update all of your selected tasks at one time. 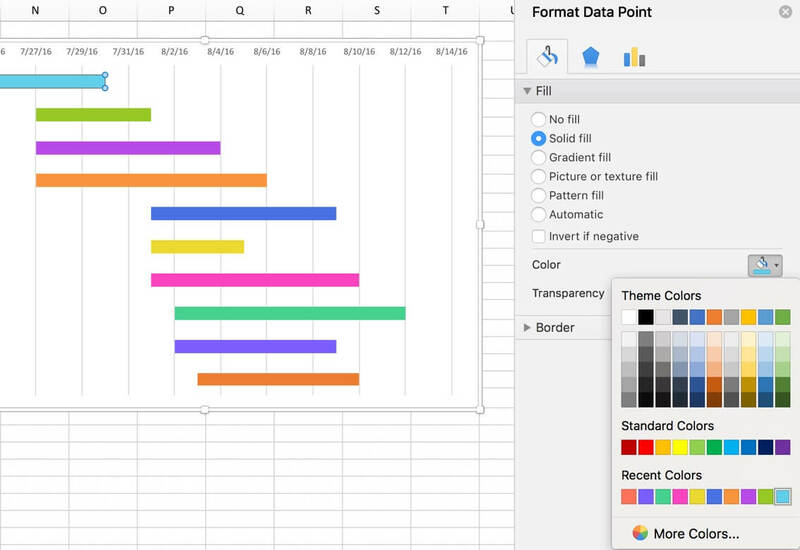 Want to Learn How to Manage Resources with a Gantt Chart? 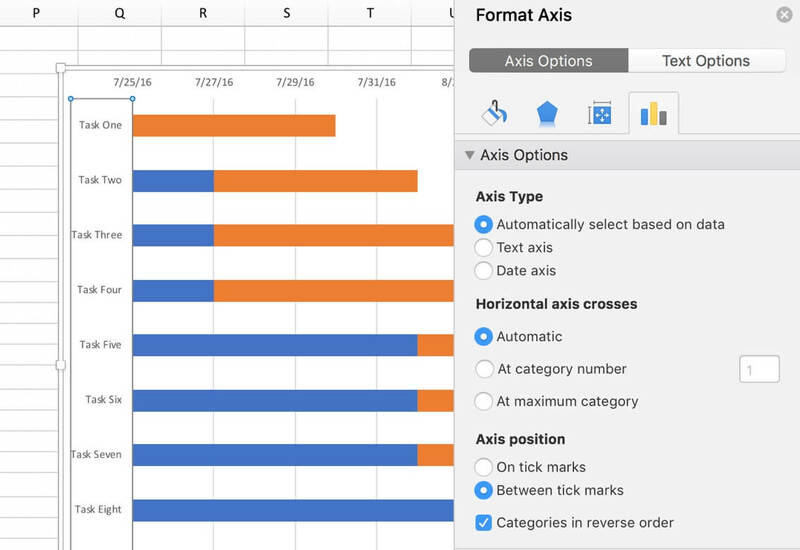 Now that you’ve got the gantt chart basics down, you’re ready to roll up your sleeves and create a gantt chart of your own! Keep reading, and you’ll learn what you need to get started and how to build a gantt chart that makes your next project a breeze. When you’re a project manager, every minute counts. So why waste time building out a bunch of complicated spreadsheets just to keep tabs on a project? At TeamGantt, you don’t have to. 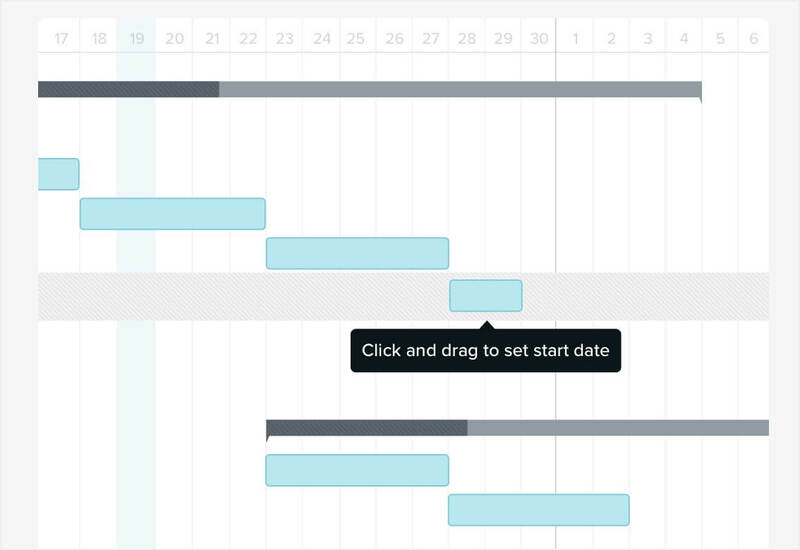 Our free online gantt chart software enables you to stay focused on the tasks that move the needle. 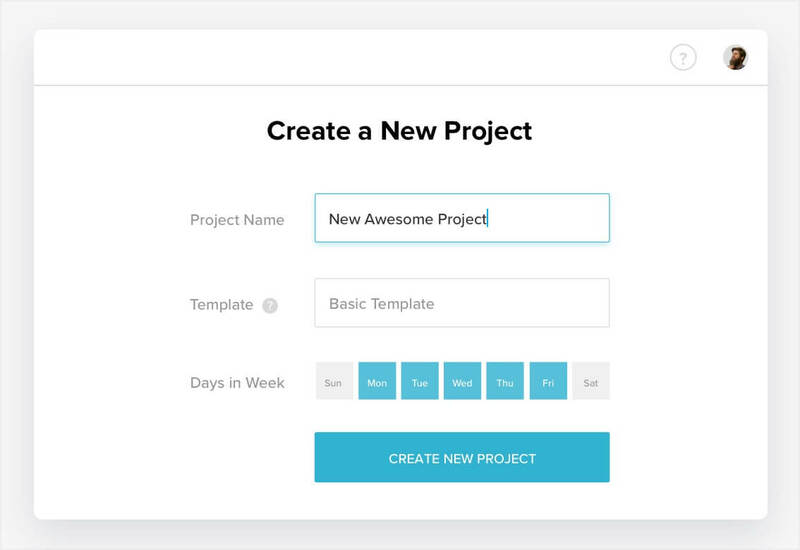 Whip up a project plan in minutes, and watch your team cross the finish line faster. It really is that simple.